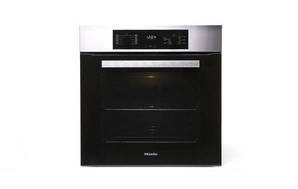 Snapshot: The Miele H 2265 BP single oven has pyrolytic self-cleaning. But how did it perform in our test kitchen? Excellent baking and grilling performance. Controls are OK to use. Visibility through the oven door is good. Can remove door and glass for easy cleaning. Grill tray has a stopper. Baking trays and shelves easy to clean. Has gentle bake function for small quantities. Oven shelves can tilt with a heavy load. Oven shelves move out loosely. Oven shelves can accidentally be pulled all the way out (even though they have stoppers). Gap between door and glass can trap condensation and spills.